Snoop Dogg is hitting the stage – the theater stage that is. 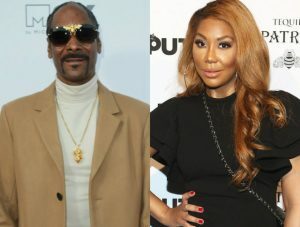 The rapper is reportedly developing a live play entitled “Redemption of Dogg.” He will reportedly co-star in the play alongside Tamar Braxton. The play is reportedly being written, directed and produced by playwright Je’Caryous Johnson. It centers around a character that appears to be based on Snoop. The play reportedly follows “the internal battle one man has between preserving his life-long legacy and losing the love of his life when he is faced with choosing fame and fortune over faith and family,” according to an official press release. Snoop’s latest gospel album, Bible of Love will reportedly serve as the upcoming play’ soundtrack. 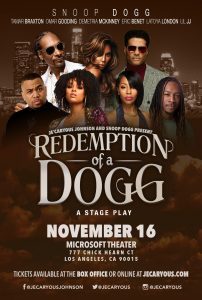 Redemption of Dogg will reportedly debut at the Hobby Center in Houston, Texas on Oct. 5. It will make several stops nationwide, closing the curtains on its final show in Washington D.C. on Nov. 11.